Sponsors of Ed Markey's SR 59 in the Senate and Alexandria Ocasio-Cortez's HR 109 in the House, as of February 20 2019. A policy group is being formed to support an energized progressive movement that's taken Capitol Hill by storm under the leadership of Rep.-elect Alexandria Ocasio-Cortez (D-N.Y.). It's called the New Consensus. The 501c(3) nonprofit is in the process of being formed to provide a policy platform that will underpin the ambitious — and increasingly politically popular — Green New Deal aimed at weaning the United States off fossil fuels, boosting renewables and clean energy jobs, and building a "smart" grid. Front and center will be Rhiana Gunn-Wright, a 29-year-old Yale graduate and Rhodes scholar who will serve as the group's policy director working to flesh out details of the plan. She's working alongside Demond Drummer, an organizer and tech guru slated to serve as New Consensus' executive director. Drummer is also the co-founder and executive director of CoderSpace, a youth tech mentoring and education program on Chicago's South Side. Gunn-Wright said during an interview she's already busy fleshing out the multipronged plan that's received national attention and revved up Democrats who recently won back the lower chamber. Gunn-Wright said she plans to release her policy in phases over time before heading to Capitol Hill. "It's not your run-of-the-mill think tank; the aim is for it to be more agile, a bit less of a sitting research entity and more of a critical problem solver," she said. "With the progressive left and all of these new, big ideas that could make people's lives better, the holdup is how to make it happen, how to pay for it." For Gunn-Wright, a Chicago native, the work is a continuation of her focus on the intersection of policy and politics. She most recently served as a policy director for the campaign of Democrat Abdul El-Sayed, a first-time candidate who captured the attention of progressives across the nation in the Michigan Democratic gubernatorial primary. El-Sayed ran on an ambitious clean energy platform that called for a shift to all renewables by 2030. Although Democrat Gretchen Whitmer, a former Michigan state senator who served as minority leader there, bested him to serve as the state's governor, El-Sayed later endorsed Whitmer and vowed to push a progressive agenda on the Hill. Gunn-Wright said the campaign served as a training ground, her first time running a policy team and doing field work — know-how she plans to bring to New Consensus. "I learned on that campaign that the best way to equip a progressive idea is to do the work of figuring out 'how,' so that's what I think we're bringing to the Green New Deal," she said. "We'll be the 'how' shop." The first tranche of New Consensus' policies aims to mobilize the United States to tackle climate change. That includes the creation of a "climate mobilization office"; ramping up funding for the Advanced Research Projects Agency-Energy, or ARPA-E, the Energy Department's research arm; and the creation of a green bank to fund clean energy innovations. The aim is for those policies to be taken up by lawmakers or a newly revived Select Committee on Energy Independence and Global Warming in the House that Ocasio-Cortez has called for. Under the platform the incoming lawmaker laid out on her website, the committee would produce a draft of the plan by Jan. 1, 2020, and finalize legislation no later than March 1, 2020. Gunn-Wright said a "climate mobilization office" would serve as a hub for planning and administering an economic mobilization to address the threat of climate change. Whether that will be an office or an agency hasn't been decided. New Consensus, she added, is drawing inspiration from frameworks set up during World War II used to coordinate government agencies involved in the war effort. Another focus: boosting funding for ARPA-E. The thought, Gunn-Wright said, is to ensure ARPA-E's funding is on par with the Defense Advanced Research Projects Agency, or DARPA. Also on the table is the creation of a "green bank," a public bank that would be used to invest in zero-carbon technologies under development in the public and private sector that need to be commercialized. The bank would be designed to offer financial enhancements and support to communities that haven't had access to clean energy and transportation, she added. "We do know what we want a green bank to do and how we'd design it, we just need to design that work at a federal level," Gunn-Wright said. Gunn-Wright during the interview outlined the broad framing and structure for a host of future policy ideas focused on decarbonizing the economy, creating climate or green jobs, and ensuring all sectors of the U.S. economy can benefit from a carbonless or zero-carbon economy. But she also acknowledged the difficulty the progressive movement faces in pushing such an ambitious idea through a Republican-controlled White House and Senate. The urgency of looming climate catastrophe — as evidenced by recent government reports the Trump administration has dismissed — will fuel her work regardless of political pushback, said Gunn-Wright. "The truth is, the best chances for success are with a Democratic president, House and Senate," she said. "But the reality of what's happening won't change. Climate change is happening, and people will die. It's not going to get easier; the reports will only become more damning and the need for action more urgent." Part of her policy work will be figuring out the mechanism to pay for such a sweeping and ambitious deal. But Drummer said mechanisms are already being fleshed out. "Right now we're focused on what needs to be done and how all the pieces fit together," Drummer said. "Then we will focus on how to pay for it. To be clear: It's a question of how we will pay for it — not if we can afford to pay for it. America can afford what we decide to do." In our conversation, Chakrabarti came across as curious and excitable—he kept using the word “gigantic” to describe the changes he envisioned—and not unlike the young people who, a decade ago, attached themselves to Obama. 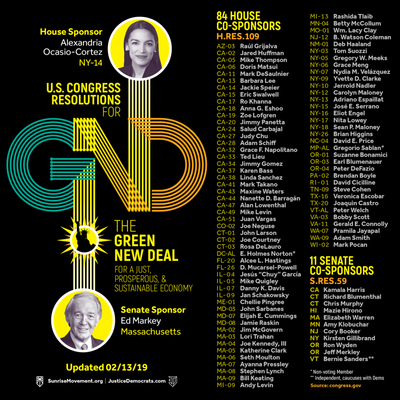 In the group that joined him to draft the Green New Deal, you can see the emergence of the next generation of the progressive élite: Waleed Shahid, the most prominent spokesman for the Justice Democrats, was the policy director on Cynthia Nixon’s campaign for governor of New York; Rhiana Gunn-Wright, the policy director for the New Consensus, played the same role for the progressive gubernatorial campaign of Abdul El-Sayed, in Michigan. The leaders of the Sunrise Movement are younger still, in their twenties, with at least as great a sense of urgency. “If you look at the latest United Nations I.P.C.C. report, we need a massive transformation of our economy, unlike any we’ve seen in recent history,” Stephen O'Hanlon, a co-founder of the group, told me. The ubiquitous young left-wing activist Sean McElwee, whose weekly East Village happy hours have drawn senators and Presidential aspirants, published an early sketch of what a Green New Deal policy might look like. Some of these people may have thought of themselves as outsiders but, to older Democrats, they must have looked the way rising leaders of the Party always have. Democrats have not hesitated, in the Trump era, to call out existential threats to democracy and to the climate. But their campaigns have not often reflected that sense of alarm—their focus in the midterms, a success for the Party, was on the defense of health-care coverage for preëxisting conditions. One early uncertainty of the 2020 Presidential race is how deep a crisis its leaders see. This week a Washington Post reporter, in El Paso, caught a bearded Beto O'Rourke in a Hamlet mode, worrying over illegal immigration and the other great topics of the day. O’Rourke praised the Green New Deal for being “bold” and said, “Thank God, the work has been done to articulate the goal, the vision, the means to achieve it.” The Post’s reporter, Jenna Johnson, noticed that he was vacillating between “a bright-eyed hope that the United States will soon dramatically change its approach to a whole host of issues and a dismal suspicion that the country is incapable of implementing sweeping change.” Which was it, she asked. “Yeah, I think that’s the question of the moment: Does this still work?” O’Rourke said. By “this,” he seemed to mean America. §Ensure justice and equity for front-line communities by prioritizing investment, training, climate and community resiliency, economic and environmental benefits in these communities. IPCC Report said global emissions must be cut by by 40-60% by 2030. US is 20% of total emissions. We must get to 0 by 2030 and lead the world in a global Green New Deal.·Americans love a challenge. This is our moonshot. When FDR called on America to build 185,000 planes to fight World War 2, every business leader, CEO, and general laughed at him. At the time, the U.S. had produced 3,000 planes in the last year. By the end of the war, we produced 300,000 planes. That’s what we are capable of if we have real leadership· This is massive investment in our economy and society, not expenditure. We invested 40-50% of GDP into our economy during World War 2 and created the greatest middle class the US has seen. The interstate highway system has returned more than $6 in economic productivity for every $1 it cost. Nearly every major Democratic Presidential contender say they back the Green New deal including: Elizabeth Warren, Cory Booker, Kamala Harris, Jeff Merkeley, Julian Castro, Kirsten Gillibrand, Bernie Sanders, Tulsi Gabbard, and Jay Inslee. New Resolution has20 co-sponsors, about 30 groups (numbers will change by Thursday). The speed of investment required will be massive. Even if all the billionaires and companies could make the investments required, they would not be able to pull together a coordinated response in the narrow window of time required to jump-start major new projects and major new economic sectors. Also, private companies are wary of making massive investments in unproven research and technologies; the government, however, has the time horizon to be able to patiently make investments in new tech and R&D, without necessarily having a commercial outcome or application in mind at the time the investment is made. Major examples of government investments in “new” tech that subsequently spurred a boom in the private section include DARPA-projects, the creation of the internet – and, perhaps most recently, the government’s investment in Tesla.